This discussion was created from comments split from: TVPad (YueTV) + BlueTV outage update (Jun, 16, 2017). Can anyone confirm that tvpad is shutting down their on demand servers around July 15? I was reading something about it in a fb AU reseller page. They said there will be a $99 charge for 1 extra year of service with their 3rd party apps and after that we would need to buy a new generation box again. Not sure if that is totally correct as I used Google translate. Thanks. So does that mean tvpad 4 is useless after this ? But we will need to wait/purchase 3rd party apps is my guess. TVPad 4 VOD will stop working after 15th of July 2017? If so, what about live TV? Also, this move is to force people to buy the BlueTV. 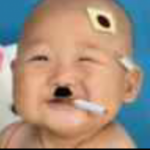 My Chinese is really bad. using poorly translated google service. This is what I gather. If the box is with 12 month of purchase (under warranty) you can trade it in for the new box and have 12 month usage. Beyond 12 month boxes, buy new box and pay annual fee? If you want to continue to get service without annual fee, get the bluetv. I would stay away with this greedy un-trusted company, they claimed it's free updated for life. Can confirm. Just received this message on my TVPad... although it says it doesn’t know when they will stop. 7/15 could possibly be the date! This is the Facebook translation version in English. Distinguished TVPad members: thank you for all your support for the TVPad products. 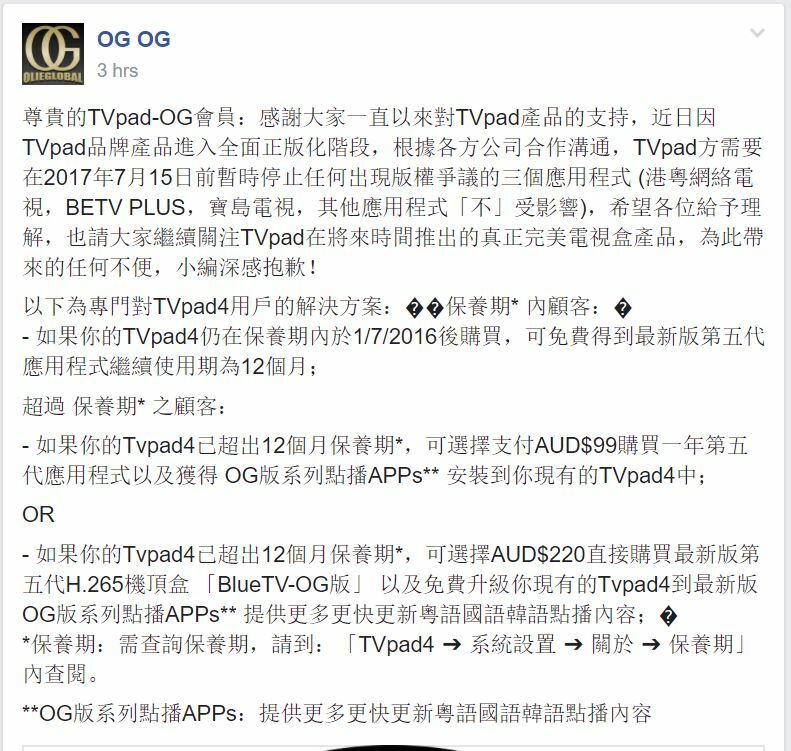 Recently, as a result of the TVPad brand products entering a full-scale phase, the TVPad will need to stop at any time before 15 July 2017 three applications for copyright dispute (Hong Kong Guangdong Network TV, BETV Plus, Treasure Island TV, and other applications are not affected), I hope you will appreciate it, and please continue to follow the true perfect TV box in the future. I'm sorry for any inconvenience caused by the product. * Maintenance Period: need to search for maintenance period, please go to :" TVPad 4 ➔ System for ➔ On ➔ Maintenance period :"
We all know that no TV box will provide forever streams/VOD and businesses use this as a selling point. TVPad 4 has been out for 2-3 years so most of us already had our money's worth therefore the next option is to either subscribe to TVB and use the TVB Anywhere app on your TVPad 4 or purchase BlueTV box if you want to stay with TVPad. Yup I agree. This is simply another trick to make everyone upgrading to BlueTV. I don't think they deserve the money. Past few weeks their service is not even up to scratch anymore with shattering VOD and constant buffering. If they end TVpad 4 I won't buy another from them at all. They can just do this money grab and run like Moonbox. Who knows how long they will stay out in business after taking your money? We know for fact that they are changing to subscription model which is what Moonbox did and they are completely dead already. Noone wants Moonbox and if they change noone wants TVpad and BlueTV. I'm planning to jump ship to HTV 5. This isn't any option. Elderlys do not have the money to subscribe money which TVB is asking for. Plus their content is very lacking. The latest TVB anywhere box is even worse in content. It is much cheaper to get one of these boxes. @cheuk5 : Base on your comment, are you saying HTV at the current state will provide a more 'broad based' free (and acceptable) VOD service over Blue TV? I have never own a Blue TV, and therefore have no point of reference. I think you own a HTV 3 box, would you say its performance is on par with TVPad4? Sorry for alot of questions. Is this BlueTV-OG version a different version than regular BlueTV? How do I contact these guys? And do they ship and work in Canada? I am still deciding between this or HTV box.